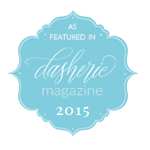 Today is the day after Thanksgiving, and I am so very thankful for amazing clients. 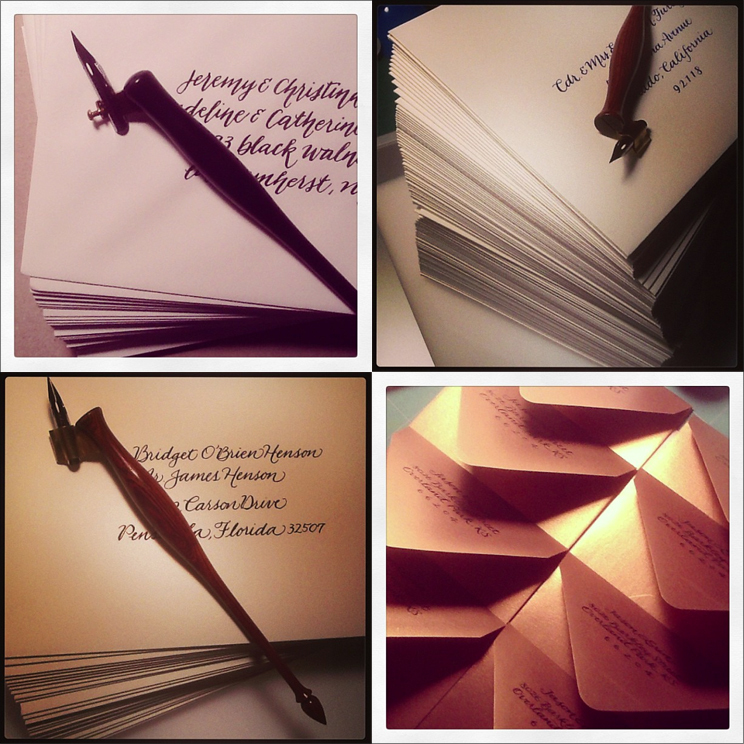 I worked with Beth on her invitation envelopes and place cards for her November wedding. She was so sweet and thoughtful to share photos from her wedding with me this morning and totally made my day! The photos look so wonderful I couldn’t believe I was looking at my own work! 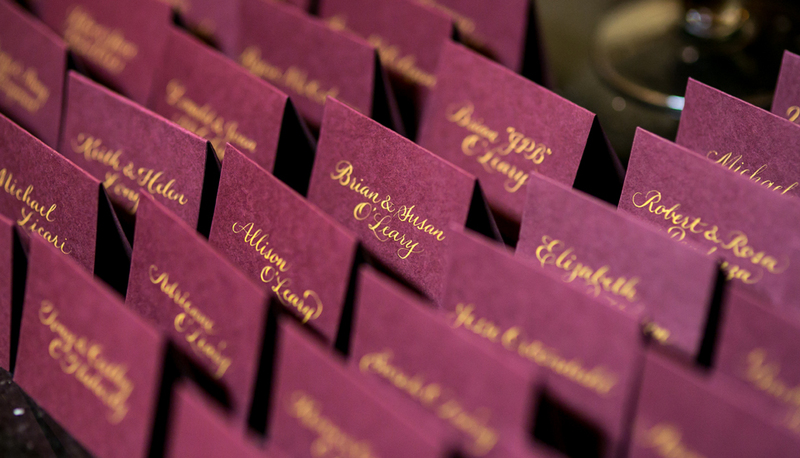 I used Schmincke’s Designer gouache in Gold Pearl on place cards from Paper Source, and Sumi ink on William Arthur envelopes lined with burgundy. Both written in Emily script. Thank you again Beth for sharing photos with me – it was an honor to work with you! 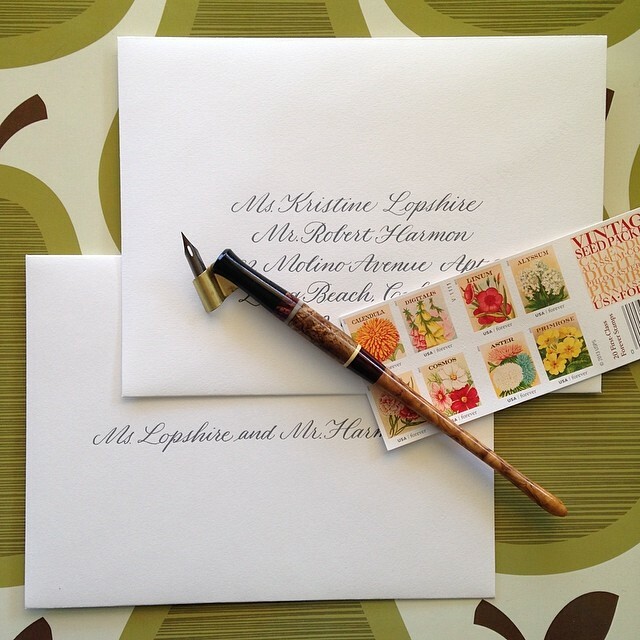 This entry was posted in Client Work and tagged addressing, copperplate, Emily script, envelopes, place cards, wedding on November 28, 2014 by linda. It was almost a year ago in November 2013, when I was contacted by Pamela to inquire about addressing envelopes for her daughter Jessica’s wedding. She wanted a casual script for the Save-the-Dates, and a formal style script for the wedding invites. Of course I was more than happy to work with Pamela and Jessica to add a personal touch to set the mood for a special day! I documented the progress on Instagram as I went along. The Save-The-Dates. A casual script, using custom-mixed gray gouache for a softer look. 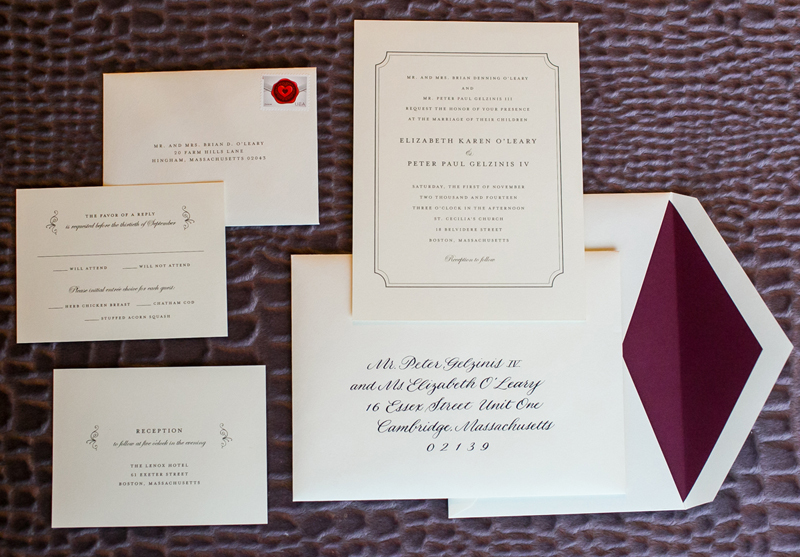 The invites were addressed in a more formal and classy style, also in a soft gray. 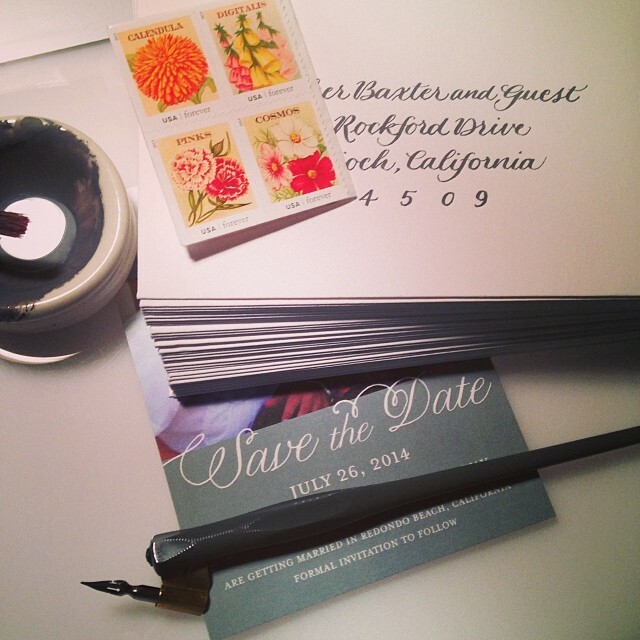 This entry was posted in Client Work and tagged addressing, envelopes, labels, save the dates, seating cards, wedding on November 9, 2014 by linda. I had the pleasure of working with four lovely brides recently: Katie C, Heather M, Erin S, and Beth H. I had such fun addressing their invitation envelopes and learned a great deal with each project. It always makes me smile to think these envelopes sharing news of love, joy and happiness are going out all over the world to celebrate these couples coming together to begin brand new lives together. Some are going as far as France, Brazil, Wales, and Serbia! I seal each package with my heartfelt thanks and very best wishes for a wonderful special day. This entry was posted in Client Work and tagged addressing, envelopes on August 2, 2013 by linda.